Instagram is one of the most widely used social media app by youth after Facebook. So is there any way out to hack Instagram account & password ?Yes, why not! In this tutorial, we will see the top best methods for how to hack Instagram password account easily. How to figure out someones Instagram password ? Well frankly speaking, this is a secondary typo methods. I mean, its like in order to have something, you need something prior! Right! So it says, if anyhow you get an access to your victim’s phone or email account or his/her Facebook Id, you’re done! Go to the login page by tapping “Add account” located at the top left corner of your profile. You can use the victim’s email if you have an access to reset the password. Either you can send an SMS to his phone number. You can also use third option of signing into Facebook if you know his Facebook credentials! That’s it. Reset the password & you’re ready to use the account. But do remember to change the alternative email or phone number for in case the victim tries to restore his access again. Being SMART yeah! Phishing is basically creating a fake page that looks somewhat exactly the typical login page, in which thereby entering the username & password you gain access to victim’s account. Let’s start. For this you need to have something where you will store this so-called “Phishing Page”. So we need a hosting account for it. You can hunt for any available out there. There are so many free as well as paid. I better recommend going for a free one for this task. There are free hosting account providers like 000webhost, hostinger, wix, etc, etc, etc. Click on any of these links & create an account there. We will be using 000webhost here. Sign up on 000webhost.com & verify your email address. Update your profile to the basic requirements needed. Now add a new website. Now you need to create a phishing page and host it on this account of yours. For this go to the file manager by clicking on “Upload Own Website“. This will lead you to the File Manager. Once you are into it, you’ll see a screen like this. If you’re not familiar with this, its the place where you can add, edit, delete & manage all the files hosted on your server. Pretty easy! Now download the Instagram Phishing Script from here. Once you’ve done upload all of these here. You may alternatively use FTP to upload the files. And there you have your Instagram Phishing page up & running! Whoila. Now hold on & use you smart little brain to find out all those DIPLOMATIC ways to send this site to your victim. Well, this is where the stunning art of Social Engineering comes in. So I’ll leave this up to you. Because this is what you invent your own! I know this maybe difficult for some, but definitely not impossible though. Use your skills to manipulate your target. The moment your victim signs in through this phished page, his credentials will be deposited in your account. To see the passwords, you just need to append “/password.html” to your site url. You can then see the details of hacked accounts. I need not explain “What to do next?” now.  Enjoy. You can also use sites like anomor, shadowave, etc to get this job done very easily. For that, please read our below articles. These are actually written for Facebook hacking but you can also use it for Instagram well. Phishing is the most used weapon for cracking into billions of personal accounts till date. Kevin Mitnick is a great ideal to look upon when we are particularly talking on this subject. High Five.! How to spy on someones Instagram ? Spy refers to finding out secret information about a person or enemy, unknowingly. This term was used for Government officials who spied on enemy countries for tactics, but it has no more remained a stranger word for common people now. Spying has always been a fun! You do this by installing certain script, backdoor or any application on the target’s device and further monitor the activities using a client program on your side. The answer to your question “how to spy on someones Instagram” is here! We are going to discuss some best spying apps here. These apps have a pretty much good reputation. It won’t be a mistake trying out on these. mSpy, Spyzie, truthSpy are some of the players we are going to discuss in this field. mSpy is a good app that helps you hack Instagram direct messages. Go to the official website & take a package you wish for your intended tasks. After signing up, get your email address verified. The mSpy send you the control panel details eventually. In Control Panel, you can go through the instruction manual on how to install mSpy on victim phone. Reach out to your victim somehow. Your only task now is to getting this application installed on your victim’s device anyhow, anyway! That’s it. You can now monitor your victim’s movements and activities easily through your control panel. Here, access the features of Instagram, wherein you can see the pictures or text messages by the victim. It also combines with many other features as well. You can also see the keystrokes by the victim using keylogger feature. How to hack Instagram direct messages? Here’s a good answer. Spyzie is another great app to name in the list. Spyzie ships in with many features as well. You can go through them briefly here. It not only allows you to read call history & logs, but also you can track text messages & GPS, browse contacts, check browser history, installed apps, monitor Whatsapp, watch videos, and many more! There’s a premium edition with restricted functionality and an ultimate edition with full functionalities just for $30 a month. If you’re interested you may signup here. The process is very simple. Get a premium account, access the target phone & get the app installed on his/her phone. You can monitor the activities through their (Spyzie’s) app too! And the best part is, they also have a demo page, where you can see how it would actually look like when you’re controlling someone! truthSpy is considered as one of the best spying apps now. It is due to the ease of its use & flexible functionalities, the spy app is preferred much these days. This app also has the same features as its counterparts. But the advantage of it is the 48 hours (2 day) free trial they offer! You can try & once you’re satisfied with it, you can go on for a purchase. Although it does take your payout details, you also have a free trial period. The app can be downloaded from their official website. One more thing is its affordability, when compared to Spyzie. It has three packages namely, standard, premium & gold. The Standard package costs for $21.99/month, premium for $25.99 while the gold one for $30.99. You may also go for a 3, 6 or 12 month plan too. Find the pricing page here. Moving forward, let’s see the next method of Brute force. This methods helps you hack Instagram account using cmd. Brute force is a technique of trying every possible combination of words or phrases, often using a list, given an input, in order to get the cracked password as result. This is a lengthy & cumbersome technique, so the reason I’ve placed it 4th on the list. But it does the work as intended for it. A good word-list is all that can bang for this method getting success. As the technique works it does make sense to describe it here. You can crack Instagram password online using this method. For this, you need to have a Linux machine up & running. You can carry out this process on any Debian-based operating system, namely, Kali Linux or Ubuntu. Step 1 : Fire up your terminal in Linux. Press Ctrl + T in Ubuntu. Step 2 : Hit the following command to clone the necessary brute force script on your drive. Step 3 : Now give the following command to grant it the required permissions. Then using “cd” command you’ll access the directory of installation. Step 4 : If you hit “ls” command, you can see the contents of the directory. The “instagram.py” is the script which we will run for the attack. But before that we need a list file containing all possible passwords we seek to brute force upon the desired Instagram account. So you can either create your own .txt file with a list of probable passwords you think necessary. You may also search online for different word-lists available. After you’re done getting a word-list file, copy it to the “Instagram” directory. Then you’re set to fire an attack . Note : You also NEED to have Tor installed on your machine to carry out this attack. This attack uses different IPs through Tor connection as a single IP is prone to get blacklisted when used frequently. So please ensure you have TOR installed on your host OS. Step 5 : Now this is the very important command which will do the brute force attack for you. It will now try every word in your list & as soon as it matches one, the attack will be finished. This is a malware type of attack vector method. Keylogger is a script or tool which functions in a way to record the keystrokes of a victim & send it to the owner or attacker. Basically, iKeyMonitor Key Logger is a password hacker app, which you can use it to on a victim. Download the free trial or purchase the app from this link. Then install the app in your victim’s phone. Once it is setup, login into your phone & control the victim’s activities without letting him know the fact. This app takes a record of every single keystroke by the user & offers back to you. In this way you have the access to your victim. You can also refer another good keylogger for Android devices here. Here are some sites which claim to hack Instagram accounts for people. I don’t know whether they are legit Instagram password cracker. This password hacker website claims to hack any Instagram account for you free. It also has a desktop application too. It just takes the victim’s username as an input. This is also an Instagram password cracker online tool which takes username as an input, searches through servers & gives you the password. Now please, this is what they speak, NOT ME. This tool scans for input username & finds password. There is a verification process before they lend you the password containing .txt file. This site also claims to hack passwords. They say it has been rated an average 9.6/10. This is an App which claims to hack Instagram accounts alongside providing various other features too. It includes unblocking yourself from someone’s list, recover disabled accounts, spy messages, privately read hidden profiles or stories. It is the only site that claims to hack into an encrypted account too. Instahax0r, Instagram password cracker, claims to hack any account at fast pace & with high success rate. Last but not least, it does the same as its counterpart sites. 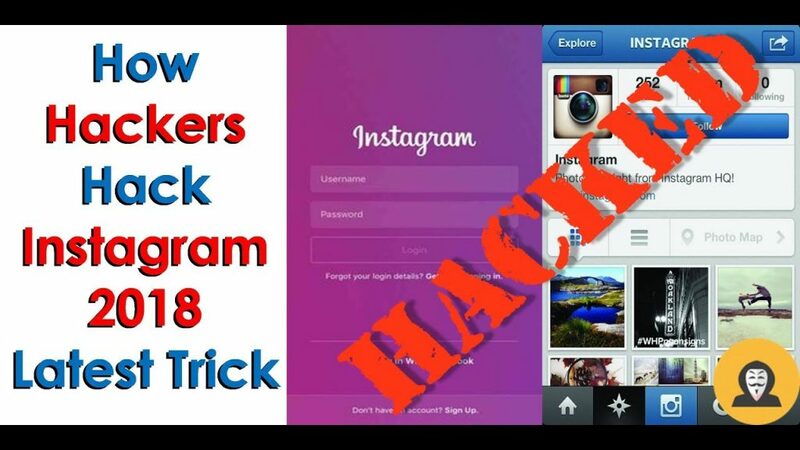 We have discussed all various possible methods of hacking into Instagram in this tutorial here. These methods are very strategically written in the same order, starting from the best, effective & genuine methods at first. Hope you will benefit from this! Good luck, hack Instagram account!